Relique Di Roma III - Mortale, Che Pensi? rec. 11-15 July 2011, St. John’s, Hackney, London. It is a firm fact of musical history that during the latter years of the 16th century in cities like Mantua and Florence, the so-called ‘Stile Rappresentativo’ burgeoned from the madrigal into what we now call Opera. The Academies were fascinated by what might have happened in ancient Greek drama and had a real delight in hearing a singer display a clear understanding of the text. Those early composers, Peri, Caccini, Marco da Gagliano and Monteverdi were the leading lights. It lesser known that Rome was also a strong centre of literary and musical developments well into the 1620s and beyond. One of the most avid patrons was Cardinal Antonio Barberini. At his court were composers like Domenico Mazzocchi and Luigi Rossi both represented on this CD. Erin Headley founded the group Atalante in 2008. Its aim is to semi-stage the cantatas, arias and madrigals of the period in costume. For this recording the group consists of five singers and eight instrumentalists including Erin Headley herself. She has specialised since her younger days in the ensemble Circa 1500 in the lirone, a strange sort of gamba which had a rather short but intense shelf life. The other instruments include a double harp and a chitarrone as well as strings. The effect is one of richness the like of which is a new listening experience for me. The booklet calls it a “luxurious continuo” and goes on to say that it is “not so much a question of accompaniment but rather a fully integrated conversation between voices and instruments”. I for one am smitten with the effect. But what of all these females listed at the top of the review? They are all women who lament the death of or abandonment by a lover. This is really a CD of Laments. One should not too surprised by this; think of Monteverdi’s ‘Lamento d’Arianna’ and ‘Lamento della Ninfa’. It was a popular form as it allowed first poets to explore a classical theme, a composer to write passionately and intensely and a singer to demonstrate the full range of his or her communicative qualities and abilities. Dividing up these vocal items are four instrumental ones. The recording gets its name from the opening work by Rossi which comes from a Barberini manuscript now in the Vatican. Apparently there are many hundreds, if not thousands, of madrigals and arias in these still little known manuscripts and many are anonymous. All singers are involved in this piece and its sets the somewhat sober mood: “O mortal what are you thinking/Your triumphs are fleeting/and there is a death at every moment …”. However it would be wrong to get the impression that the music is all rather dismal - quite the reverse. The way it is performed is moving, exciting and at the highest artistic level. Anyone who thinks that recitative is just of the ‘secco’ variety that you find in opera or in a Handel oratorio need not be concerned. 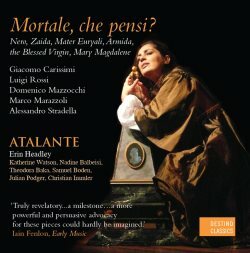 These recits and these arias and cantatas are dramatic and intensely expressive with regular harmony changes, vivid word painting and opulent instrumental support. They are, the booklet reminds us, “extravagant arias”. Let’s take one special example by Marco Marazzoli, which takes the subject of the Lamento d’Armida and is set for mezzo and continuo. Armida is a Muslim in love with a Christian who sails away without her. Her anger is played out in two sections more like an arioso. The continuo is strongly, even violently played to emphasise certain points of the text. For example the opening “Whither are you fleeing, cruel one” and again later “Go away wicked man … and may heaven and the waves and the wind….. arm themselves with a dark shroud”. She then changes her mood and there follows a contrast. This takes the form of a gentle aria in compound time to describe the gently rolling waves for “Depart under favourable skies may the wind assist you and may the waves be calm”. Finally there is an instrumental postlude. I can’t help but wonder what the singer does during this final section. I have never heard accompanying continuo played so dramatically or for that matter such committed singing in this repertoire. These are dramatized performances. Not only have these singers and players brought this forgotten music to light they are performing it surely as it must have been done four hundred years ago: to move the audience to tears and to bring the story to life. I must single out Baka for praise but do also listen to Nadine Balbeisi in Rossi’s equally passion-ridden Lamento Zaida. The sufferings of these mythical women mentioned above are as nothing in comparison to those of the Virgin Mary at the foot of the cross. This is reflected in the anonymous A piè del sanunoso tronco, sung equally exquisitely by Samuel Boden. The text is by no less than Antonio Barberini himself. At the end we are told that the Virgin, having accused her son of being the source of her torture, “fell senseless to the ground” just as you see in many Renaissance paintings. The sufferings of Mary Magdalene are represented in the last piece by the remarkable and iconic Domenico Mazzocchi in his Lagrime amare. This CD is beautifully recorded and the booklet comes with complete texts, performers’ biographies and some photographs, also two essays by Erin Headley. The first goes through the composers and the background to the pieces. The second, at the back, is entitled ‘Enharmonic Exotica’ in which Headley discusses some of the period’s instrumental oddities like the lirone and the even more bizarre tuning methods found and heard in the Mazzocchi ‘Lagrime’. Ideal really.